On 16 August 2016, Inter-Services Public Relations (ISPR) stated that an operation was launched “to reinforce troop deployment in Rajgal Valley to effectively check and guard against” movement across the porous border in Khyber Agency. The operation targeted “movement on high mountains and all-weather passes in Khyber Agency,” the statement said. ISPR Chief, Lt Gen Asim Bajwa, claimed, “nine terrorist hideouts were destroyed through aerial strikes”. The Raheel-Nawaz regime has been under consistent pressure from its masters sitting in Washington to bring the Afghan Taliban and Haqqani network to the negotiation table, for over two years. In order to do so, the regime in Islamabad applied a carrot and stick policy. 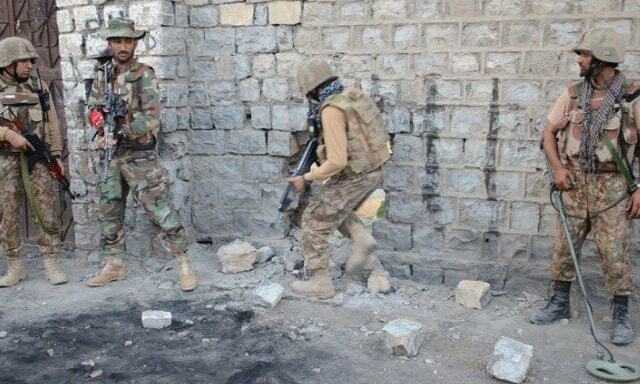 The regime launched an extensive North Waziristan operation in June 2014. Since then, there have been ups and downs regarding bringing the Afghan resistance to the negotiation table, in order to compel them to accept the American envisaged political process for Afghanistan, which ensures the American presence in the region. However, the Raheel-Nawaz regime could not bring the Afghan resistance effectively to the negotiation table, which frustrated America. In order to further pressurize its agents in Islamabad, the Obama administration changed the terms of selling F-16 fighter aircrafts to Pakistan and eventually the deal broke down in May 2016. On 21st May 2016, a US drone killed Afghan Taliban leader Mullah Mansoor in Pakistan which further humiliated the regime. On 10 June 2016, a high-level delegation of the US, including Gen. John Nicholson, Commander Resolute Support Mission in Afghanistan, and Richard Olson, US Special Representative for Afghanistan and Pakistan visited Islamabad and met Pakistan’s Chief of Army Staff, Gen. Raheel Sharif. Gen. Raheel insisted that they must understand Pakistan’s challenges with regard to the porous border, inter-tribal linkages and decades-old presence of over three million refugees. In order to prove their commitment Raheel-Nawaz regime arranged a visit of Senator John McCain, Chairman of the Senate Committee on Armed Services, to the North Waziristan region. Although McCain endorsed the claims of the regime that it has cleared the bastion of the Haqqani Network, the Pentagon blocked USD 300 million military aid to Pakistan on 3 August 2016 after Defence Secretary Ashton Carter declined to give a certification to the Congress that Pakistan is taking sufficient action against the defiant Haqqani network. So in order to fulfill its master’s demands, the Raheel-Nawaz regime launched some new initiatives, including a new offensive in Rajgal Valley of the Khyber agency. As well as the Pak-Afghan border management system. The purpose of these steps is to create pressure on the Afghan resistance on two fronts. One is on the battlefield and the other is by increasing the misery of Afghan Muslims, which has increased many folds, as millions of them are now forced to leave Pakistan soon, whilst creating hurdles in their daily crossing of the Pak-Afghan border, which seriously damages their businesses and relations with their relatives living on both sides of the border. The Raheel-Nawaz regime only cares about the interests of its master, the US, which is an enemy of Islam and Muslims. The misery and destruction faced by the Muslims of Pakistan and Afghanistan can never end, unless the US presence is uprooted from this region. And this will never happen until the Khilafah (Caliphate) on the Method of the Prophethood is established because only the Khilafah implements Islam and Islam has made it mandatory to expel the enemy from Muslim lands. Previous PostIs China’s Starting a “Central Asian NATO”? Next PostO My Brother Pattani Muslims…Surely We Are Both Not Independent Yet!